Old Long Island: Old Long Island Turns 2! Old Long Island Turns 2! Today is the second anniversary of the creation of Old Long Island. After all this time there have been 663 posts, 195 estates featured, a few thousand pictures uploaded, about 50,000 visitors and almost 300,000 page views. So I hope you have enjoyed it and I hope I have enough material to continue for at least another 2 years. Above is the Lightship Nantucket (LV-112) docked in Oyster Bay Harbor. It was in use from 1936 to 1983, shining light on the shoals on Nantucket. Now it sits in the Harbor awaiting its somewhat unknown future. 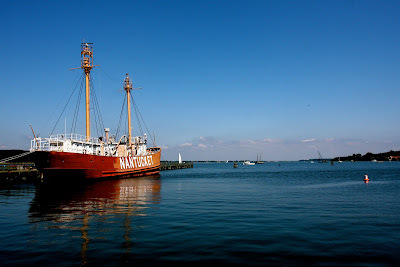 Click HERE to see the Lightship Nantucket on google earth. Happy 2nd Birthday Old Long Island! And thank you Zach for all of your time and effort into making this site the most valuable and important source of Long History to date. We are indebted to you. Many many thanks to Zach for the enormous work he puts into this astonshing site. It's an invaluable historical record. Also kudos to Aesthete's Lament...your comments are priceless! I have to say many thanks also! A favorite part of my daily routine. Hoping that you have at Least 2 more years of material. Along with the everyone above, congratulations on your second anniversary and thank you very much for your hard work and dedication. I enjoy your blog very much and look forward to another two years... and hopefully more! happy birthday, zach and thanks for all the incredible work. my favorite site. keep the fantastic pix coming. Thanks everyone! Have a great holiday. It is always a pleasure visiting your site.